The fatal police shooting of an unarmed black teenager in Ferguson, Missouri, and the subsequent civil unrest in the St. Louis suburb, has led to a spike in firearm sales at some local gun shops, according to the St. Louis Business Journal. Two local gun shop owners said that typically sluggish summer sales have gone up by around 50 percent in recent days, as showdowns between angry Ferguson residents and militarized local police have resulted in at times violent demonstrations, police aggression, and the arrest of dozens. 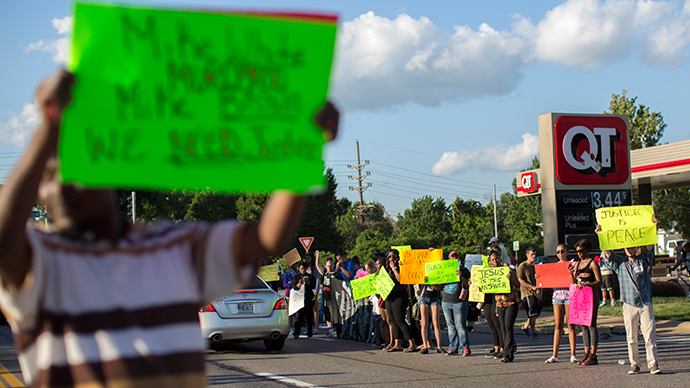 The unrest was spurred on by the fatal shooting of 18-year-old Michael Brown by a Ferguson police officer. Steve King, owner of the Metro Shooting gun store just 8 miles down Interstate 70 from Ferguson, told St. Louis Business Journal that his shop has been “unbelievably busy” in recent days. King said both black and white customers have been in the store in recent days, some buying new guns while others have looked to upgrade. Al Rothweiler, owner of Mid America Arms about 15 miles south of Ferguson, reported a similar spike in gun sales in this week during a normally slow month for his $3.5 million business. Yet John Ham, public information officer for the US Bureau of Alcohol, Tobacco, Firearms and Explosives’ Kansas City division that includes the St. Louis region, told the Journal he doesn’t believe firearms sales have increased significantly in the area. 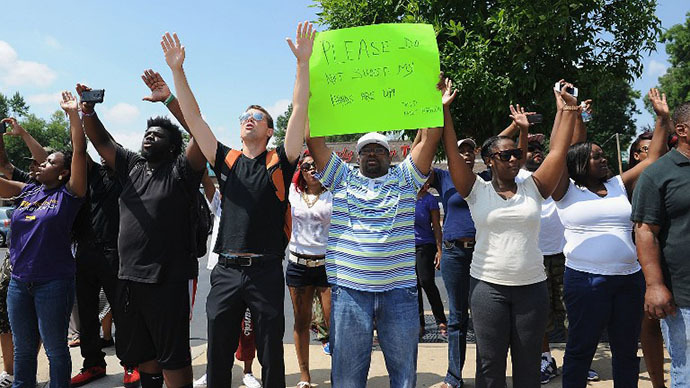 Meanwhile, Tuesday was another tense day in Ferguson, as around 250 demonstrators marching along Florissant Avenue - ground zero for protests in the town of around 21,000 residents this week - were met by heavily-armed officers that demanded the mostly African-American group of protesters disperse immediately or face arrest. The tense showdown ended without violence or arrests, according to The Guardian, though the relatively calm end to the standoff is unlikely to be the last instance of raw emotion among residents. 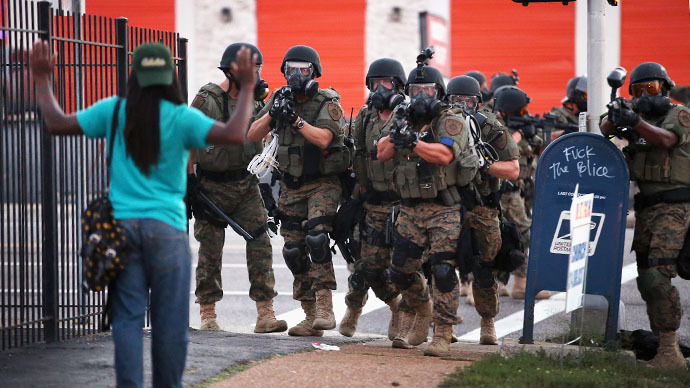 "[T]here is definitely still an antagonism there," said Patricia Bynes, a Democratic committeewoman in Ferguson. A separate skirmish nearby led police to fire some tear gas containers at demonstrators, the St. Louis Post-Dispatch reported. 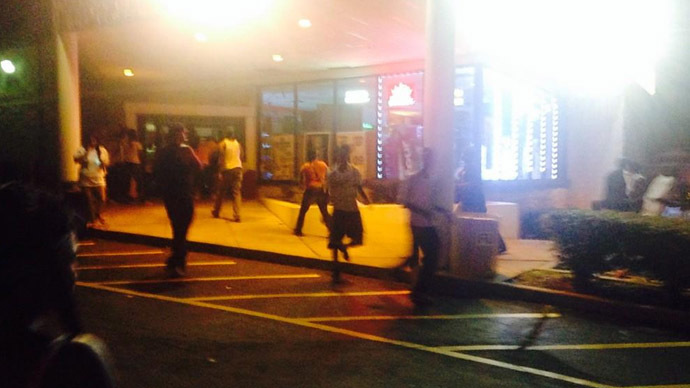 One man was shot and critically wounded by police in Ferguson early Wednesday. 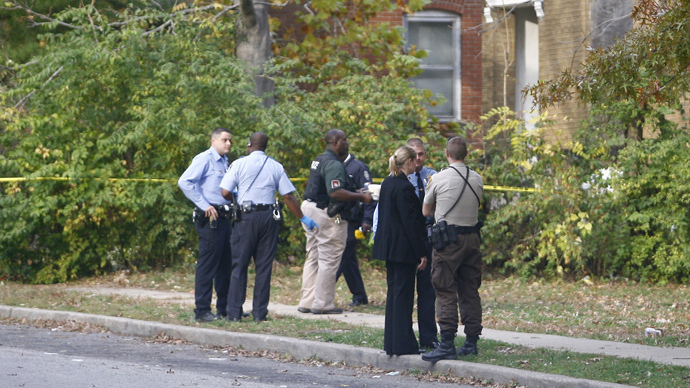 The shooting happened less than a mile from where Brown was shot on Saturday, according to the Post-Dispatch. St. Louis County police were responding to reports of four or five men wearing ski masks and carrying firearms. Police officers arrived and found "multiple subjects running," said police spokesman Officer Brian Schellman. When police approached one man, he allegedly pointed a firearm at an officer, who shot the man in the early morning hours. In addition, a woman was shot in the head near a QuikTrip gas station near the site of many of the demonstrations this week. It is not known whether the shooting was related to the protests in the area. She is expected to survive. 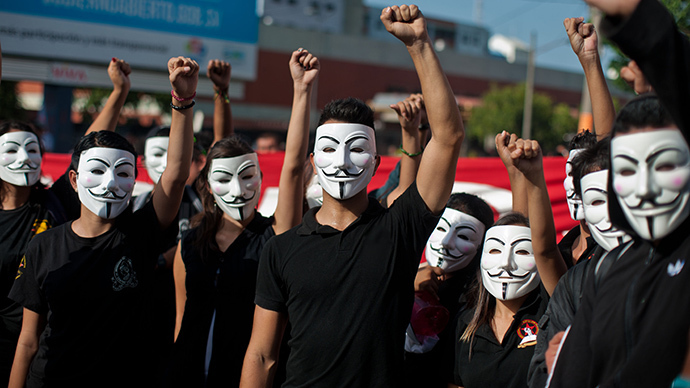 Also on Tuesday, the hacker group Anonymous, seeking retribution for what they see as police brutality in Ferguson, released the private information of St. Louis County Police Chief Jon Belmar and his wife and children. Earlier in the day, separate meetings - with two different tones - were held at area churches, as speakers called for justice in Brown’s slaying. “Justice must not simply be pursued, but in fact achieved. 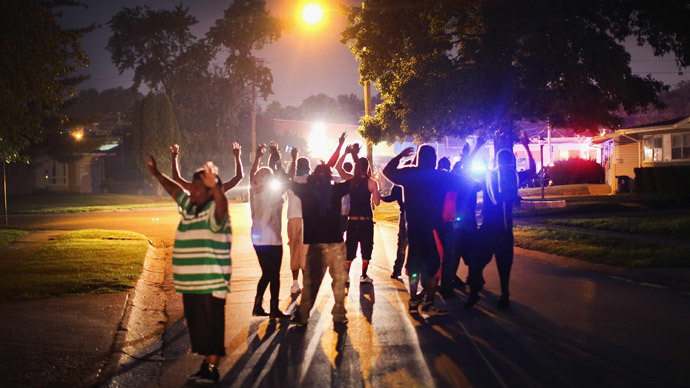 Instead of burning bridges in anger, we must rebuild them with love,” said Missouri Gov. Jay Nixon at Christ the King United Church of Christ near Black Jack. The crowd of 400, “many of whom were ministers, politely applauded the speakers” at the gathering, the Post-Dispatch reported. “I want what you want. I want the truth and I want justice and I want it as soon as possible,” said Ferguson Police Chief Thomas Jackson at the meeting. The other rally, held at Greater St. Mark Missionary Baptist Church, “was much louder and less formal,” the Post-Dispatch reported. Rev. Al Sharpton led the crowd in the chant “No justice, no peace,” and noted the racial incongruities that exist in Ferguson’s police force as opposed to its population. Ferguson, a majority African-American suburb of St. Louis, has a police force that is made up of 53 officers, only three of whom are black. The FBI has announced it has opened a civil rights investigation of Brown’s shooting. Police officials claim Brown was shot after a struggle over a gun with a municipal police officer in a squad car. Witnesses, though, say the unarmed Brown had his hands raised when the police officer approached with his weapon drawn and fired repeatedly.